Meiji Jingu (also known as the Meiji Shrine) is a Shinto shrine dedicated to the deifed spirits of Emperor Meiji and his consort, Empress Shoken. The shrine was built in 1920 by over 100,000 volunteers. It was first dedicated on November 1, 1920, but the imperial spirits had to be moved to new installations on October 31st, 1958, since the original building burned down in 1945 during the WII’s air raids. The rebuilding of the shrine was made possible by public donations. The site consists of a main shrine, an inner shrine, a outer shrine, a treasure house, a consecrated kitchen (for the preparation of food offerings) as well as some office buildings and these buildings are mostly build out of Japanese cypresses with copper plates roofs. 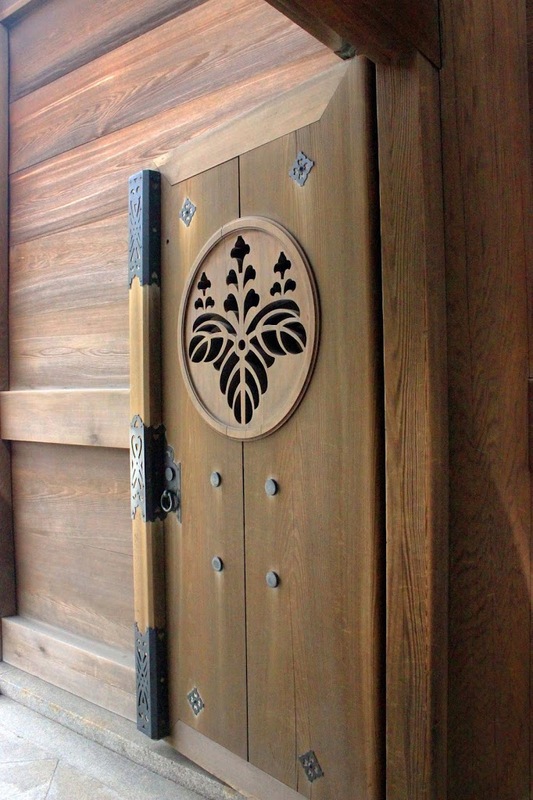 The shrine is accessible via one of the two Toriis (shrine gates). Do pay attention to the gates and, as you gaze up at the largest one, know that it was made from cypresses imported from Taiwan that are more than 1,7000 years-old. Passing through those gates is meant to purify you for subsequent praying. Emperor Meiji was the 122nd emperor of Japan (you can see portraits of all the emperors in the museum). He ascended on the Chrysanthemum Throne in 1868 at the age of 14 and, from then on, ruled for almost half a century. His reign was marked by an opening toward foreign countries and a development of culture. The Meiji Era is considered one of the most glorious and prosperous periods in the history of this country, which was founded as the Empire of Japan in 660 BC by the mythical Emperor Jimmu. During Emperor Meiji’s reign, Tokyo replaced Kyoto as the capital of the country. The emperor, supported by his wife, worked tirelessly to bring Japan into modernity. He brought about the Meiji Restauration and put an end to the Tokugawa government. At the time of the birth of the emperor in 1852, Japan was an isolated, pre-industrial and feudal country dominated by the Tokugawa Shogunate (the feudal Japanese military government which existed bewteen 1603 and 1868) and the daimyos, who ruled over the country’s more than 250 decentralized domains. 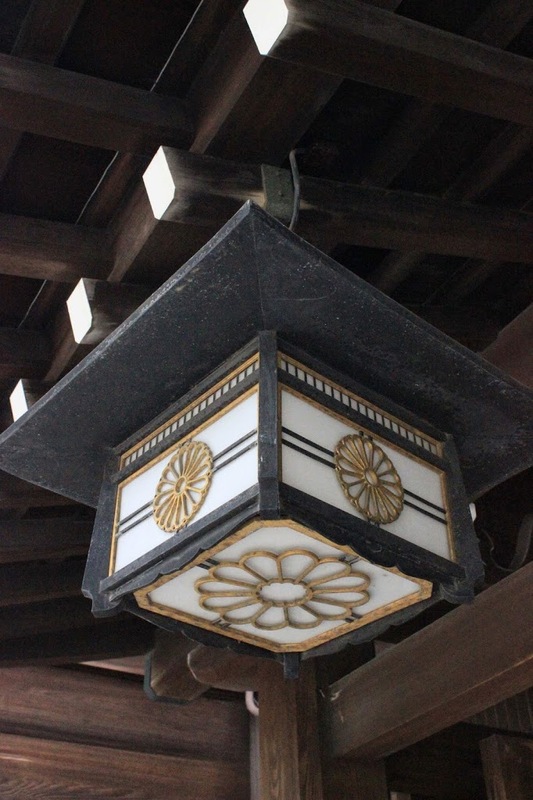 The Tokugawa shogunate ruled from Edo Castle and those years became known as the Edo period (the pre-modern period). At the time of his death in 1912, Japan had undergone radical political, social and industrial transformations which allowed it to emerge as one of the great powers of the world. Emperess Shoken was a prodigy of her time. However, being older than the emperor caused problem when it came to marriage – a problem easily solved by changing her date of birth. She assisted the emperor behind the scene and became a model for the modern Japanese women. Emperess Shoken was well known for her support of charity work and women’s education. She also contributed to the establishment of the Japanese Red Cross Society. She created a fund fot the Internaitonal Red Cross, which was later named the Empress Shoken Fund. The emperor died on July 30, 1912 and the empress followed on April 11, 1914. On the day of our visit, J and I were fortunate enough to witness a wedding procession going through the courtyard. 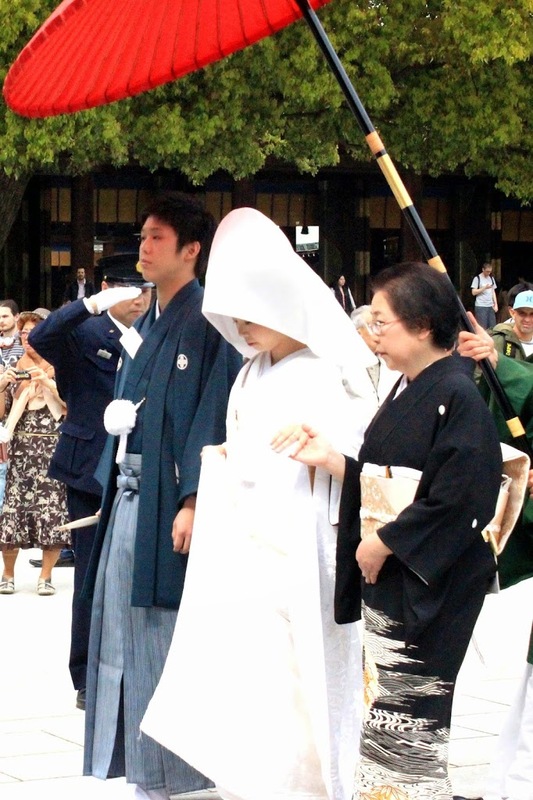 The bride wore a white kimono and the groom a black traditional outfit. As they walked behind the priests, they were shielded from the sun under a bright red parasol. A fairly large procession trailed behind. The combination of the austere setting with its natural surrounding made for a very peaceful visit, even despite the amount of tourists walking the grounds. Meiji Jingu is accessible with the JR Yamanote line to Harajuku Station. The shrine is adjacent to Yoyogi Park, so grouping the two could be a good idea.